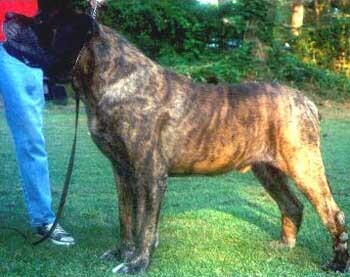 Sagar, a beautiful apricot brindle dog, became one of our more popular stud dogs towards the end of his life. He proved to produce type and size that was more representative of his pedigree than of himself, which is, of course, something to be admired in a stud. You can see some of his Canadian offspring here. 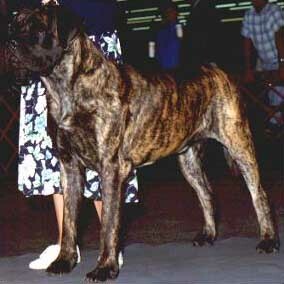 Sagar took a good while to mature and he was quite a contrast to what was winning in the show ring in the early 90s. Sagar possessed superb movement and excellent structure, but appeared dwarfed next to the more overdone, not quite so sound dogs that represented his competition. This shot to the right was taken of Sagar at 17 months of age at one of the shows he won. Despite all that, he gathered all of his majors quickly and remained in need of a single point for some time. After taking a while off to mature Sagar returned to the ring to gain his championship. 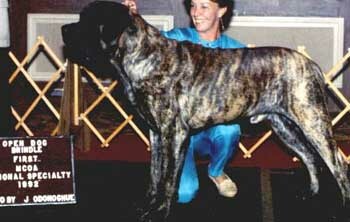 Sagar came along for the 1992 National Specialty where he won the Open Brindle Dog class, and he is pictured here with Cathy Babbins for the show photo. Sagar exhibited one of the most perfect rears we have ever produced. His angulation was excellent without being overdone, and his second thigh was naturally occurring. 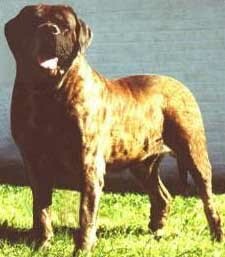 Though Sagar was not a large dog (31 inches tall and 190 pounds) he did posses good body and bone, and he certainly had the capacity to produce offspring with more type than he had (case in point his son Blake). Sagar was a very sweet dog and he is a big part of our line today. He also happens to have OFA certified hips and elbows.